Delicious little vanilla soufflés that are only 2 Weight Watcher points if made with Splenda. I heard somewhere that Pinterest is single-handedly responsible for America getting more obese... really! I can relate. For some reason, my "Food" board is at least 10 times bigger than any other. 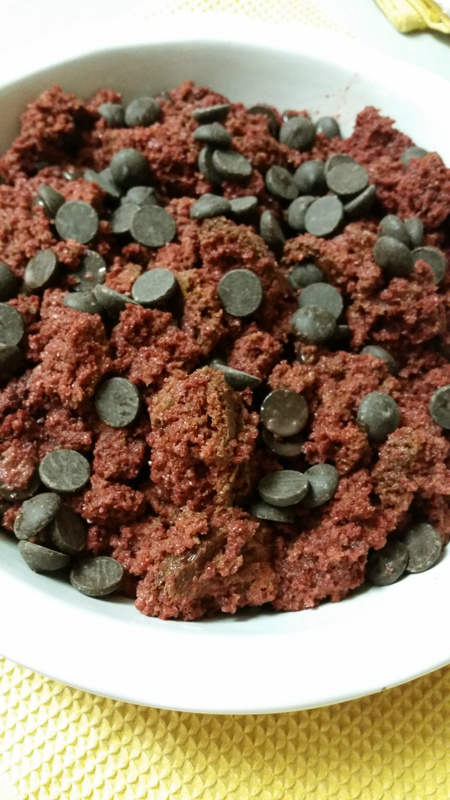 I don't know if it's the pictures or the zillion ways to make things out of Red Velvet batter, but I'm hooked. 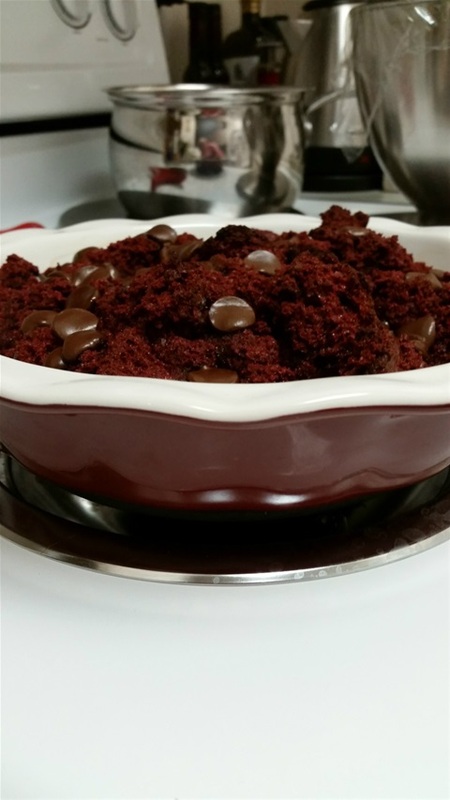 I happened to be on Weight Watchers when I spied this recipe on Pinterest. When I calculated the points for one serving at 2 points (using Splenda), I went for it. I did use vanilla bean and I would recommend it. The picture at the right does not have vanilla bean - if it did it would have wonderful, tasty little black specks in it! Speaking of vanilla beans, did you know why they are so expensive? Let me tell you! Vanilla beans are dried vanilla fruits primarily from a Mexican species of orchid. Vanilla is the second most expensive spice after saffron, according to Wikipedia. This is because growing the vanilla seed pods is labor-intensive. The website "BioWeb" states that it can take up to 5 years for a vine to mature to be ready to produce pods, and that the actual orchid flower is only open for 24 hours and must be pollinated or else the flower drops from the vine and no pods can be produced. I now have a new appreciation for vanilla beans! On to the souffle! This delicious, light, creamy, deliciousness is a breakfast, brunch, or anytime treat disguised as a dessert. The individual souffles are best right out of the oven before they fall, but after cooling and refrigeration, they can be enjoyed for breakfast, cold. The ingredients are simple and straightforward, and the souffles take about 10 minutes to make. One of my favorite things about them are that the ramekins you cook them in are dusted with butter and sugar. After eating the souffle it is imperative that you lick the sugar out of the ramekin! This recipe is all about finess, beating, and whisking. Just have a light touch and you will do fine! Preheat oven to 375F. Butter and sugar 6 ramekins and set on a baking sheet. 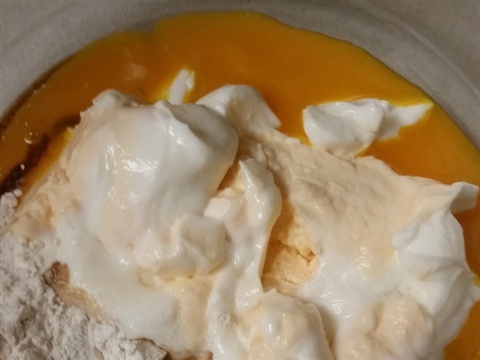 In large bowl whisk together yogurt, egg yolks, flour, salt and vanilla. 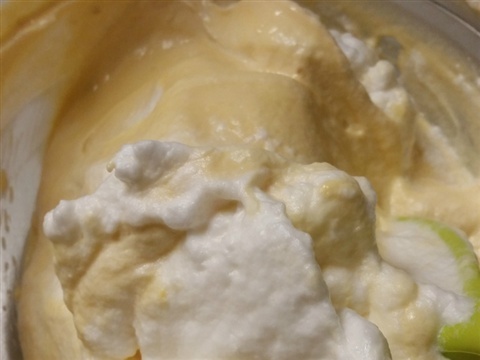 In a stand mixer beat the eggs whites and cream of tarter until foamy, then gradually pour in the sugar and whisk until firm, forming soft peaks. Don't whip so hard that the whites separate. 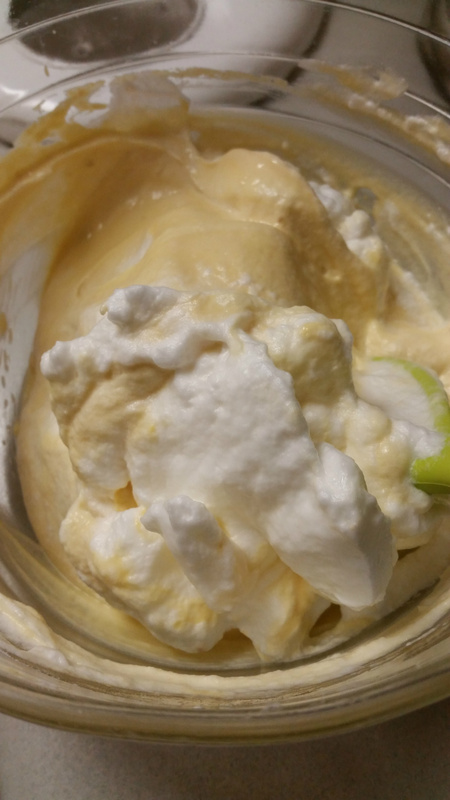 Add 1/3 of the egg white mixture to the yogurt mixture and fold together. Continue two more times, keeping as much volume as possible. Sugar coated ramekins ready to go into the oven! 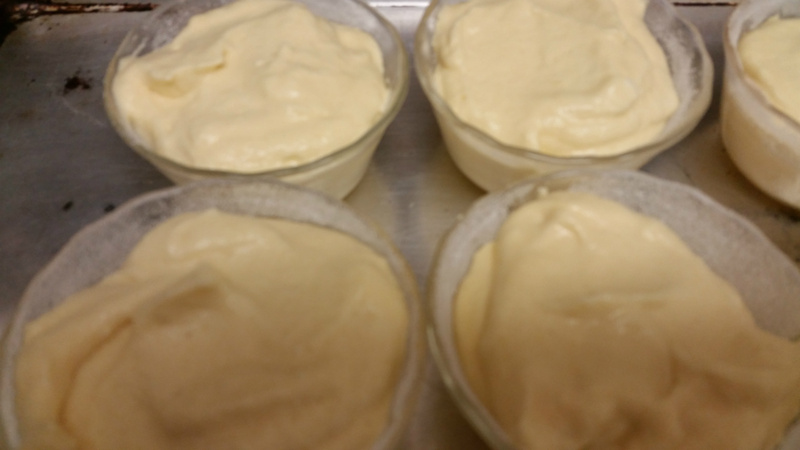 Divide mixture evenly into ramekins, leaving about a 1/2 inch from the top. The soufflé will rise at least an inch as it cooks. Bake on tray for 15 minutes. Do not open the oven to peek! 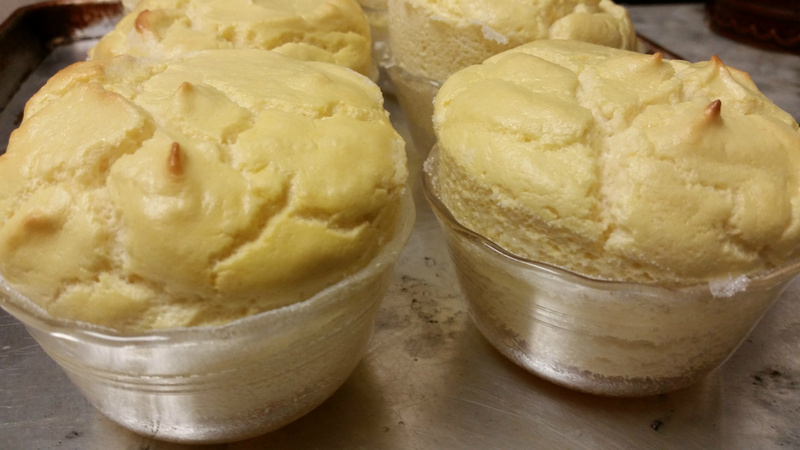 The soufflé should be light brown around the edges. Serve immediately. 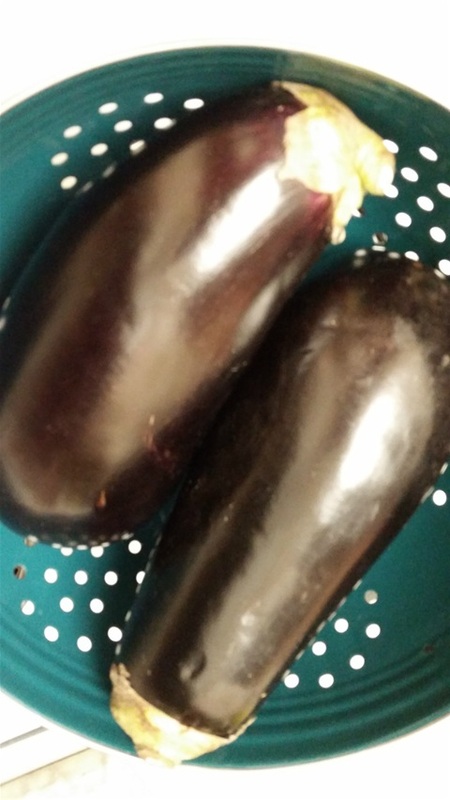 I give eggplant a try! Ah, the beautiful aubergine! It is such a pretty veggie. My sister had her hair colored aubergine once. The word slips off the tongue so easily. There is no doubt that eggplant is a totally kitschy, yet traditional vegetable. I planted a couple of eggplant starts a few years back and they grew the cutest little eggplant. However, I do not like the taste! I know, you can bake them with cheese and sauce, or bread and fry or bake them...I still don't care. For some reason, the taste just turns my stomach. I will eat other white, soft, watery vegetables such as zucchini, and even okra, but no thanks to the eggplant. We have an awesome market down the street that features produce, at a great price, like I've never seen before. The Persian cucumbers, every fresh herb you would ever want, berries, fruits, bulk greens galore, and the eggplants, are all just begging to be purchased; and purchase them my husband did! Since I needed to cook these buggers and I didn't want to slather them with sauce or cheese, I turned to my mom's 2006 Weight Watchers Cookbook. 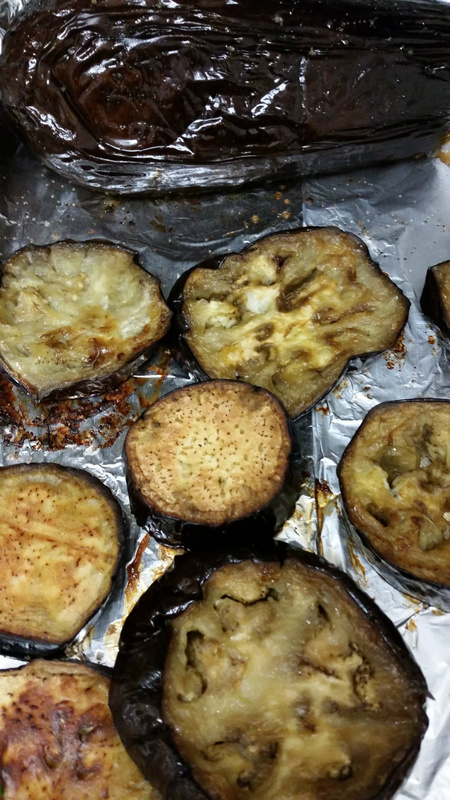 I really like to roast vegetables, so roasting these eggplant sounded like the way to go for me. 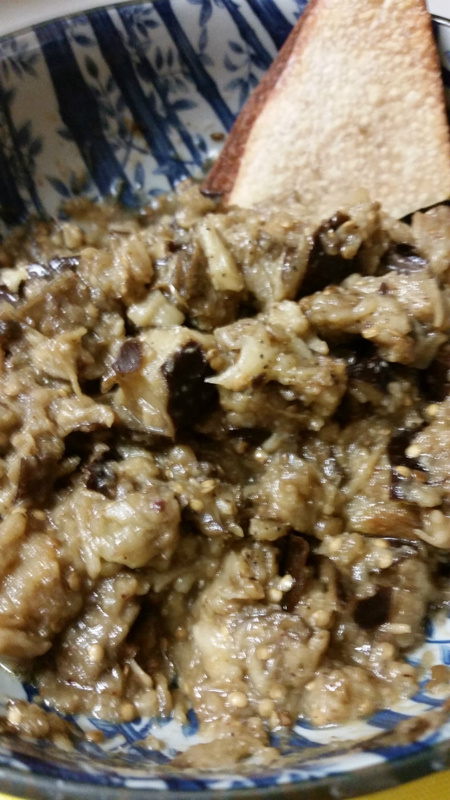 I won't keep you in suspense - I tasted the roasted eggplant before I made the Baba Ghanouj - and yuck! Still didn't like it!! But, I have to say, that after I mixed it with the lemon juice, olive oil, garlic and spices, I actually was able to eat it. 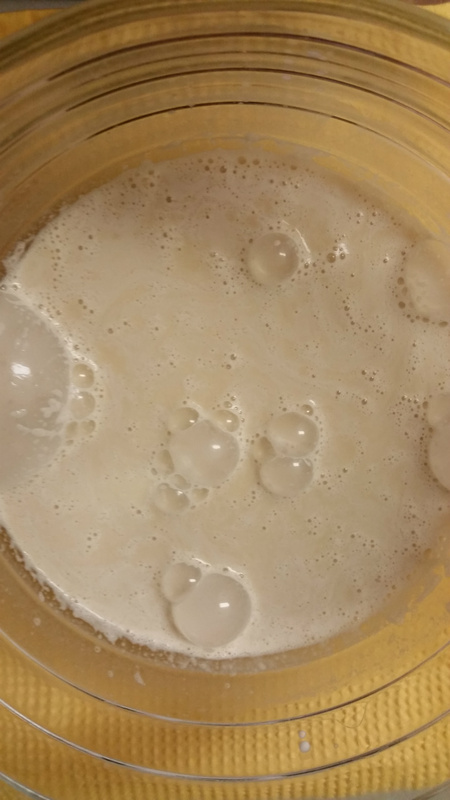 It had a nice, fresh taste and the consistancy was a bit chunky because I mashed it instead of processing it. This dish is traditionally made in several different ways in the Middle East and India. Some versions cut the eggplant, others mash it. In some places tomatoes and onions and various other veggies are added. The Weight Watchers version is very basic and does not have other veggies - presumably to keep the points down. One serving is worth 2 points ( a cup of dip and 1 small pita). Preheat oven to 425F. Line a baking sheet with foil and spray with nonstick spray. 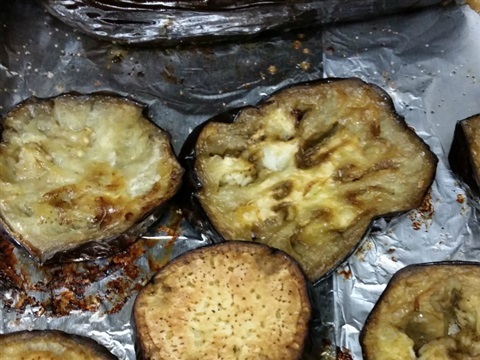 With a knife, pierce the eggplant several times and place on the baking sheet. Roast, turning once or twice, until soft and the skin is charred, about 45 minutes. Let stand until cool enough to handle and peel off skin (I left the skin on). 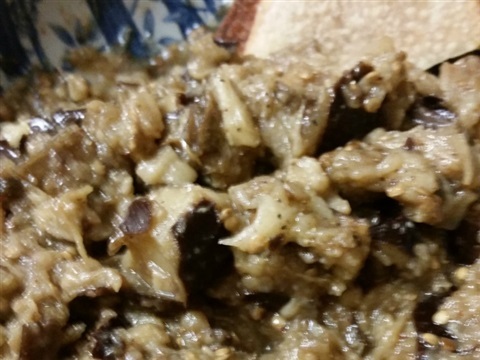 In a medium bowl, mash the eggplant. Stir in the lemon juice, oil, garlic, paprika, coriander, and salt. Serve with pita or crudite'. *** A note about pita bread. When I'm trying to watch my carbs, I don't buy things like pita. 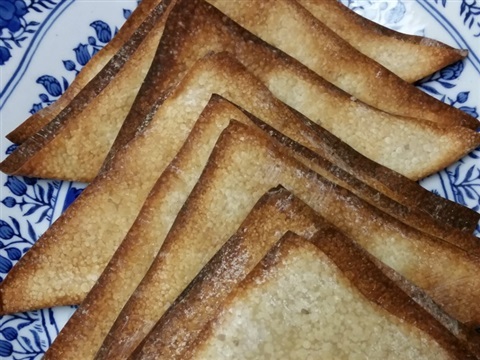 I learned a little trick - use baked eggroll wrappers as an alternative to bread. See below for details. I sliced one eggplant and cooked one whole. 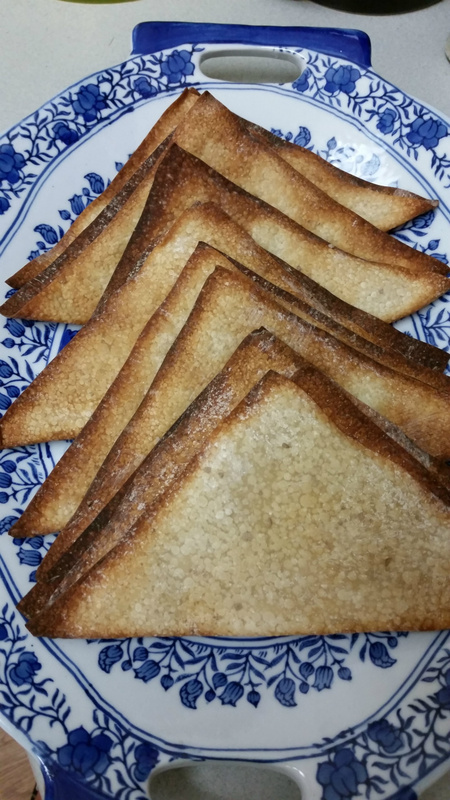 I painted both with olive oil and salted them a bit, even though the recipe did not call for it. My Baba Ghanouj with baked eggroll wrapper instead of pita bread. These are 2 points a piece on Weight Watchers. Eggroll wrappers are usually found in the produce section and are refrigerated. I bake them, painted with a bit of olive oil and salt on each side, on a cookie sheet in the oven at 400F for 8 minutes or until they are brown and crispy! This bread pudding is worth the one-day wait to make it! 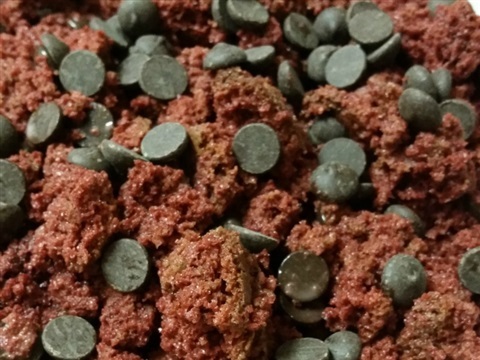 Yes, you could use any cake mix you want to make this recipe. If the flavor did not combine well with chocolate chips, you could use mint chips, white chocolate, or peanut butter. Why not try sprinkles instead? Perhaps forego the chips completely and just make or heat-up a sauce to pour over the top when serving it? Hot fudge, caramel, strawberry, or traditional hot buttered rum? I'm thinking chocolate cake with peanut butter chips and a bit of hot fudge on top, or Funfetti cake with sprinkles and strawberry sauce on top. I do believe that the possibilities are endless!! This recipe comes from a website called wineandglue.com by Lisa Longley. I made it and basically it was really, really good. You could just go to the website but I actually made some changes to the recipe that I think improved it so you should just make mine! **Note this recipe takes 2 days to make so plan ahead. -One Red Velvet cake mix (and the ingredients it calls for, eggs, water, oil), baked in a jelly roll or flat cake pan. 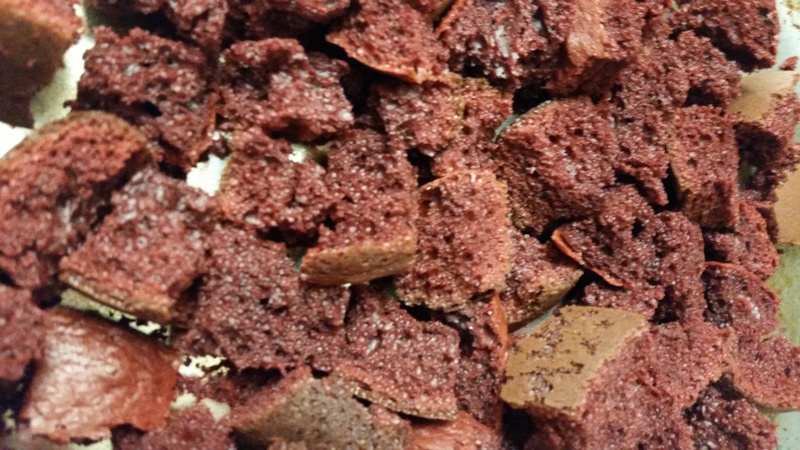 Chunks of Red Velvet cake drying overnight. First, make the Red Velvet cake mix following the directions on the box. After it is baked and has cooled, use ONLY HALF of the cake. Cut it into 1" pieces and put them on a pan, covered with a towel, for at least overnight to dry-out. I turned them halfway through so that they would dry on both sides. 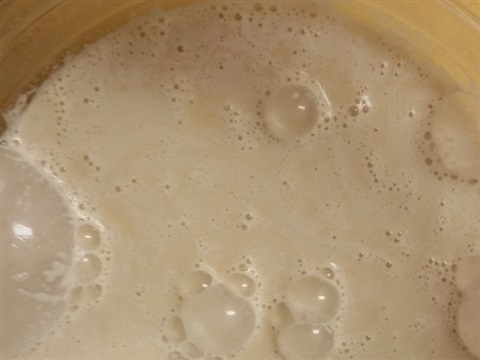 If you want to use the whole cake you will need to make twice as much egg mixture and use a larger dish for baking the pudding. 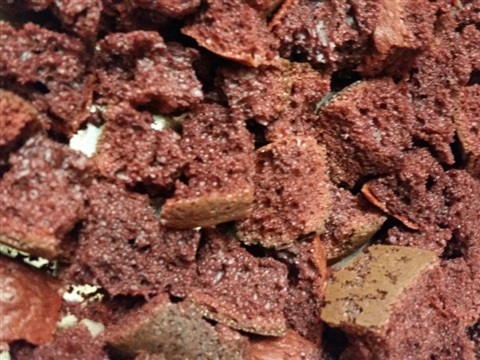 When cake chunks are dried, beat the egg mixture together. 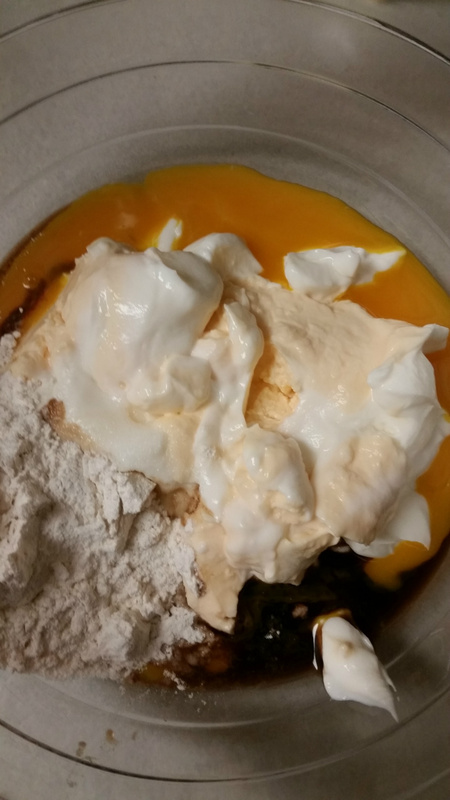 Preheat oven to 350 F. Mix the eggs, milk, heavy cream, and vanilla in a large bowl. Add the chunks of cake. Combine gently with a large spoon until all of the cake has been saturated. Let it sit for just a couple of minutes to absorb all of the liquid. If it sits too long you will end up with red soup. Bake the pudding for 35 minutes. Add one cup of chocolate chips to the mixture and stir them in. 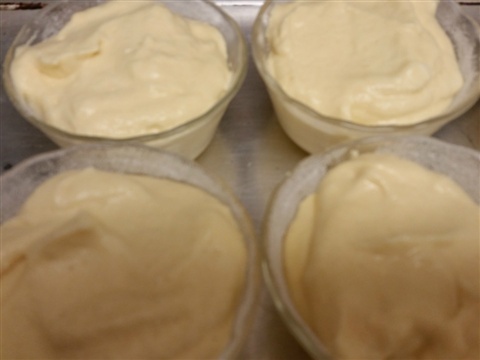 Top the pudding with the other cup of chips once you have poured it in the baking dish. I baked the pudding in a pie plate that I greased with butter. It is DELICIOUS served warm. A Tisket a Tasket a....Corned Beef Brisket! 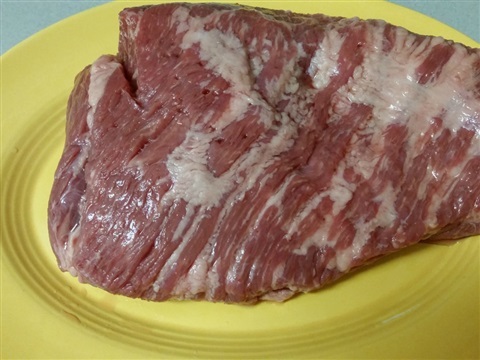 I was in the grocery store yesterday and noticed a lady buying several packages of corned beef brisket - you know, the ones that are everywhere now for St. Patrick's Day. I hadn't planned on cooking one this year, but I slowed down with my cart, sidled up to her, and asked, "So how do you cook your brisket?" She explained to me that she has a big party every year, does several crockpots of traditional boiled corned beef, cabbage and potatoes, and also does oven baked. She said that her guests, hands-down, voted that the oven baked was the best. Here is her recipe. I made it and immediately went out today and bought another one for next week because it was so good! Foil- line a large baking dish. 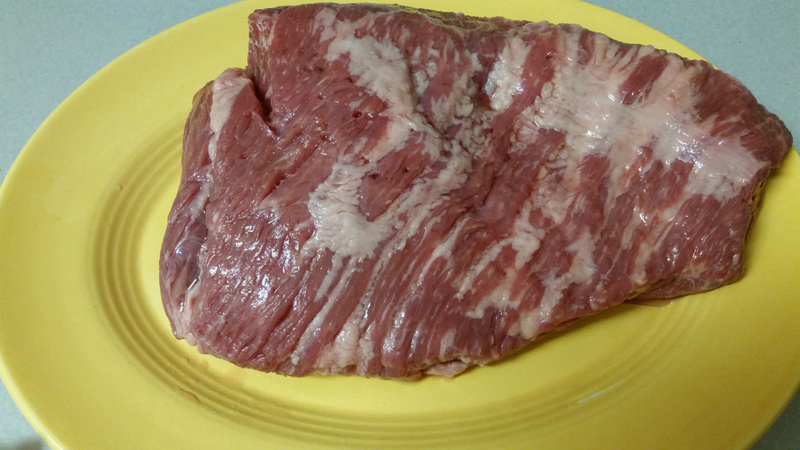 Remove the corned beef brisket from the package. Rinse and pat dry. Don't season - it has already been brined. Place in foil-lined baking dish. Coat meat with 3/4 of the jar of Aoili - top and bottom. Use the whole jar if you really like mustard! 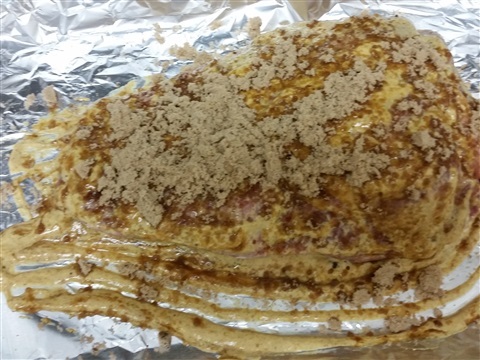 Using as much brown sugar as necessary, pat brown sugar all over the meat. When finished, pour the Guinness over the meat. 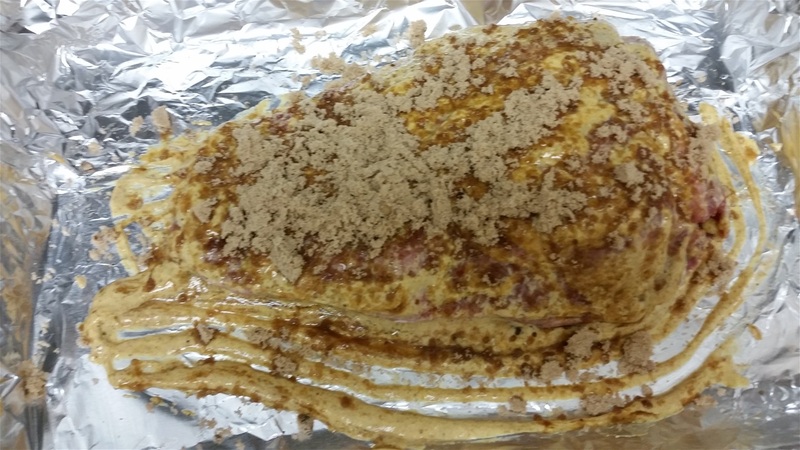 Do this carefully so that the mustard and brown sugar does not get washed off. Using a large spoon, baste the meat with the run-off. 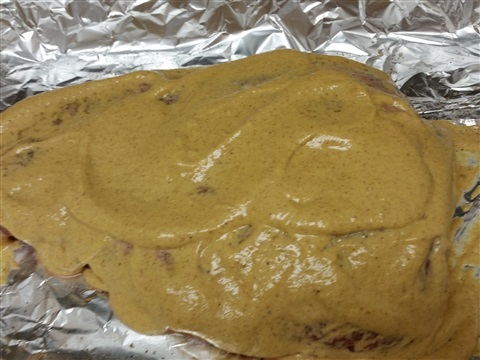 Cover the meat with a tent of foil, sealing it to the sides, and roast in the oven for 3.5 hours. About 2 hours into it, baste the meat. After 3.5 hours (don't cheat, leave it in there!) uncover the meat and put it back in to brown for 30 minutes. When you take it out it will be carmelized and beautifully brown.Let it cool before cutting it across the grain. If you want - you could put in carrots and chopped potatoes about 2 hours into the roasting and let them cook in the amazing drippings. You can also use the drippings to make delicious gravy! 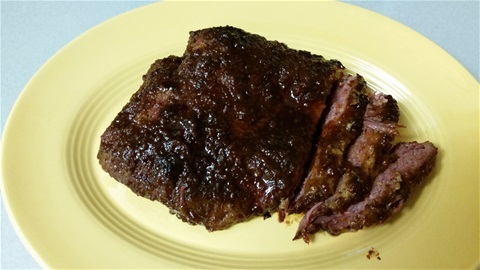 A packaged corn beef brisket rinsed and patted dry. Garlic mustard aioli on all sides of the meat. 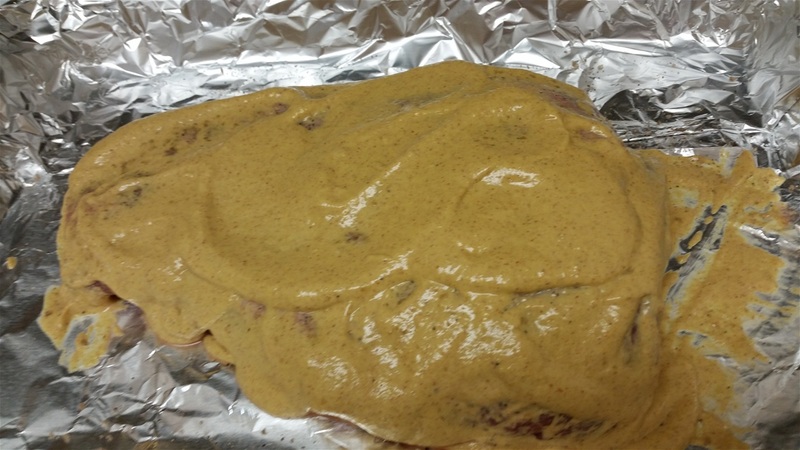 Brown sugar patted over the aioli. Beer is poured over this.